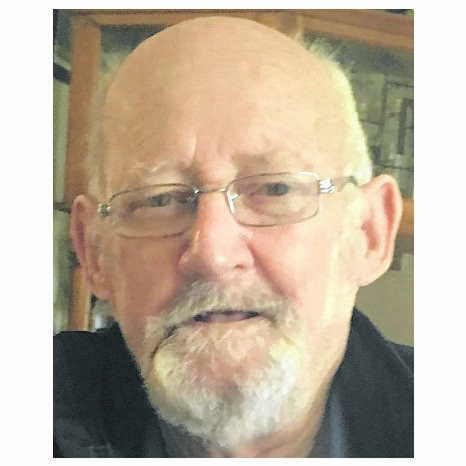 02.08.1936 - 06.04.2019 Passed away peacefully. 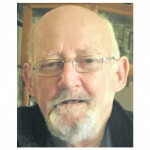 Beloved Husband of Lorraine. 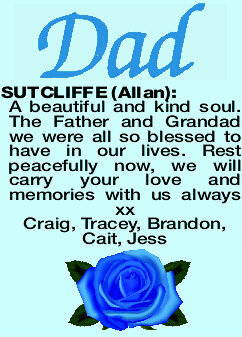 Adored Father of Rod, Julie (dec) and Craig and Father-in-law to Julie and Tracey. Loving Granddad to Brett, Adrian, Cameron and Brandon and Proud Great Granddad of Koa. At peace with Julie. The memories will live on. 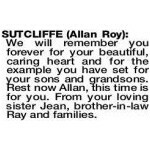 A Funeral Service to Honour the life of the Late Allan Roy Sutcliffe of South Guildford will be held in St Matthews Church, Stirling Square, Meadow St, Guildford commencing at 10am on T UESDAY (16.04.2019). 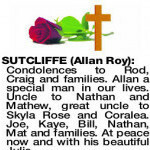 Following the service the cortege will proceed to M IDLAND Cemetery, Myles Rd, Swan View for the Burial at 11am. 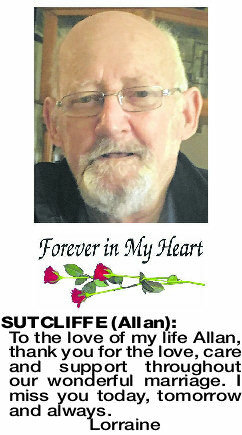 Loving memory of Allan Sutcliffe, you will be missed but not forgotten. Uncle to Nathan and Mathew, great uncle to Skyla Rose and Coralea. With love Joe, Kaye, Bill and families. 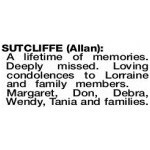 SUTCLIFFE ALLAN To the love of my life Allan, thank you for the love, care and support throughout our wonderful marriage. I miss you today, tomorrow and always. 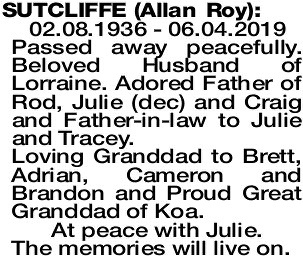 We will remember you forever for your beautiful, caring heart and for the example you have set for your sons and grandsons. 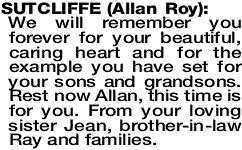 Rest now Allan, this time is for you. From your loving sister Jean, brother-in-law Ray and families. 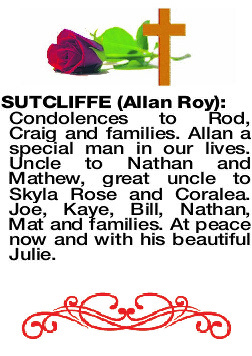 SUTCLIFFE ALLAN ROY Condolences to Rod, Craig and families. 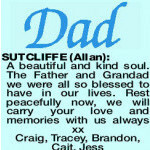 Allan a special man in our lives. Uncle to Nathan and Mathew, great uncle to Skyla Rose and Coralea. Joe, Kaye, Bill, Nathan, Mat and families. At peace now and with his beautiful Julie. Loved Brother-in-law of Gane and June. Together with Lorraine we have travelled a lifelong journey together. A link now broken. A lifetime of memories. Deeply missed. 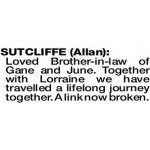 Loving condolences to Lorraine and family members. Margaret, Don, Debra, Wendy, Tania and families. 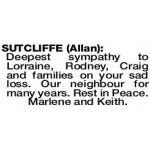 Deepest sympathy to Lorraine, Rodney, Craig and families on your sad loss. Our neighbour for many years. Rest in Peace.